Churchill Brothers FC Goa made a strong statement of intent with a fully deserving 2-1 win over defending champions Bengaluru FC in an encounter played at the Tilak Maidan in Goa yesterday. Bengaluru who slumped to their second straight defeat finished with ten men after John Johnson was sent off for a foul on Richard Costa. Bengaluru had taken the lead through a Sunil Chhetri penalty before Anthony Wolfe equalised and Chesterpaul Lyngdoh scored his debut goal to seal their first win back in the I-League fray. 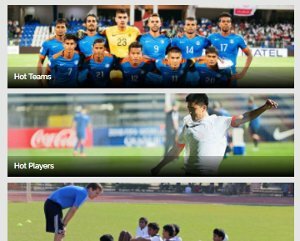 Bengaluru FC made three changes from the last match with Roby Norales, Alwyn Geroge and Nishu Kumar brought into the starting line-up. 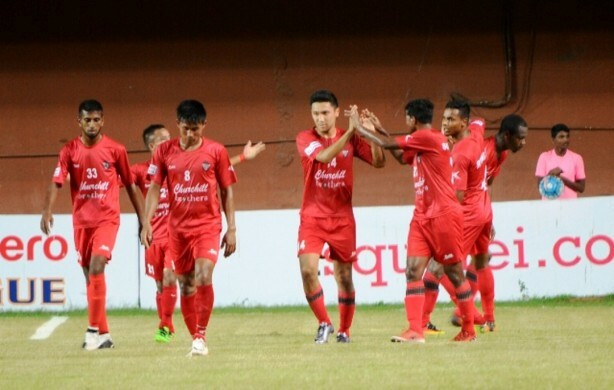 Meanwhile, Churchill Brothers made two changes from their draw against DSK Shivajians with Surabuddin Mollick and Surchandra Singh coming in place of Seriton Fernandes and Brandon Fernandes. The first ten minutes of the match saw Bengaluru FC enjoying the majority of possession but no end product as Churchill Brothers were trying to disrupt their game and not allowing them to get into their groove. Bengaluru finally managed to conjure up the first chance when Blues skipper Sunil Chhetri dribbled his way past two defenders in the midfield before releasing CK Vineeth clear on goal. The current top scorer got on the end of the pass but his shot went across the goal and out of danger. However, Churchill’s defensive indiscipline which has been their undoing in the previous matches came back to haunt them. A run into the box by Bengaluru forward Norales was illegally checked by Fulganco Cardozo as the referee awarded a penalty and a yellow card at the stroke of 20 minutes. 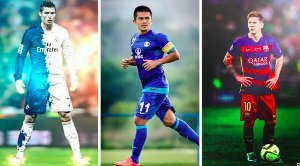 Sunil Chhetri stepped up to take the penalty and smashed the ball emphatically into the net to put his team at the front. Chhetri created another goalscoring opportunity when he ran down the left touchline before floating in a perfect ball for Norales. The Honduran striker could not time his header as he buried the ball into the ground and away from the goal of Priyant Kumar Singh. 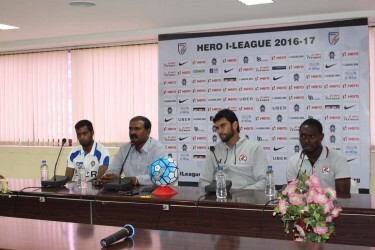 Bengaluru defender Juan Fernandes picked up an unnecessary caution when he collided with Churchill forward Anthony Wolfe at the half hour mark. Albert Roca’s men, however, got exposed and their struggles with the long balls came to the fore when Churchill Brothers roared back into the match. The Trinidad and Tobago striker stretched out his right leg to get to the ball before Amrinder could reach as the ball rolled into the net to make it 1-1. The first half was an evenly contested affair in which both teams returned with the spoils as the score was 1-1. The second half had an intense start with an end to end football on show. Five minutes into the second half, Surabuddin tried a shot from distance that blazed over the bar which fired up the healthy crowd in attendance. In the 53rd minute, Chesterpaul conjured up a moment of magic. The youngster was fed with a through ball and the winger showed the composure and class of a seasoned player to dink the ball over a goalkeeper of Amrinder’s quality. Churchill were leading 2-1 and they decided to sit back and defend their precious lead. John Johnson was given the marching order in the 82nd minute by the referee when the English defender tackled Richard Costa dangerously. As the Blues ran out of their gas, Churchill Brothers closed in their first victory of the season, pulling themselves up to the seventh position with 4 points in their kitty. Bengaluru FC stay stranded at the fourth spot with 9 points, having bagged from their first three home encounters.